Our volunteers work tirelessly every week. 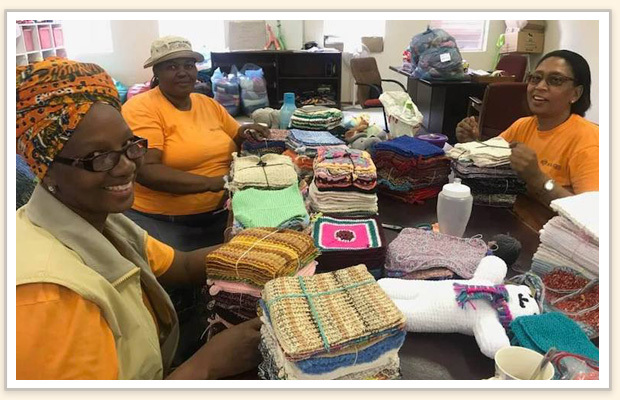 They open packages, assemble blanket packs for the gogos (grandmothers) to sew and organise your donated items. 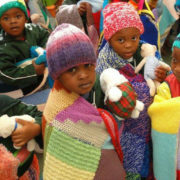 You can help make their jobs easier and ensure we wrap more blankets around cold, orphaned or vulnerable children by following the important steps listed below to package your squares. Please also consider, beyond your compassionate crafting for the children, a small donation. Every few dollars adds up to make it possible for us to warm the children. Make sure your squares are 8” (20cm). Butterfly the 20” (50cm) tail for sewing up to avoid tangling during unpacking. Bundle large numbers of squares into 5’s or 10’s. The squares can also be bundled into square packs of 35 if there are enough of them. Send your squares flat. It takes time to unroll squares. Use cling wrap as squares develop an odour. Send parcels over 20 kg (44 lbs.) from Australia, Canada or the United States or parcels over 30 kg (66 lbs.) from the UK. 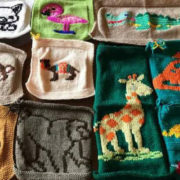 Yarn – we always need yarn to sew together and edge the blankets. Acrylic is welcomed. Yarn needles – we always need these for sewing the blankets, both plastic and metal are great. Crochet hooks – 4.0mm (US size G/6, UK/Canadian size 8) for edging the blankets so they remain strong. We do not need any more knitting needles at this stage – we have a box full! When you package your squares, please include a Packing Inventory Slip. The South African volunteers find the job of recording each item much easier when a Packing Inventory Slip is used. Download the PDF above and print. Fill in the ‘This package contains’ describing what items and the quantity you are sending are in the parcel. Fill in your contact details in the ‘Contributor Details’ section. You don’t have to fill in everything unless you want to, but we’d really like a name, country and email address. Cut along the line marked with the scissors. Put the top part of the form inside your package, before you seal it. Do not be concerned if it seems to take 3 or 4 months for your name to appear. It takes several weeks for surface mail to arrive, then the time to travel to the local post office, be unpacked and recorded by KAS volunteers. Please follow the link above for guidelines on posting your parcels.